The authors, Rich and Sue Freeman, decided to make their living from what they love -- being outdoors. In 1996 they left corporate jobs to spend six months hiking 2,200 miles on the Appalachian Trail from Georgia to Maine. That adventure deepened their love of the outdoors and inspired them to share this love by introducing others to the joys of hiking. They went on to explore hiking, bicycling, skiing, snow-shoeing, and waterfalling trails throughout Central and Western New York State. The Freemans' passion for outdoor adventure continues. In 1997 they thru-hiked the 500-mile long Bruce Trail in Ontario, Canada. In 1998 they bicycled across New York State, following the Erie Canalway Trail and 1999 found them hiking a segment of the Florida Trail. 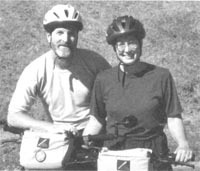 In 2000 they bicycled the C&O Canal Trail from Washington D.C. to Cumberland, MD. In 2001 they hiked across northern Spain on the Camino de Santiago Trail and hiked a section of the International Appalachian Trail in Quebec, Canada. In 2002 they climbed the highest mountain in Africa-Mt. Kilimanjaro. The Freemans regularly present slide shows about their adventures. For the most current schedule see www.footprintpress.com under Event Schedule. They also publish a free, bi-monthly e-newsletter on outdoor recreation in central and western New York State. For a free subscription, enter your email address on the home page at www.footprintpress.com. Since beginning their new career writing and publishing books, the Freemans have pared down their living expenses and are enjoying a simpler lifestyle. They now have control of their own destiny and the freedom to head into the woods for a refreshing respite when the urge strikes. Still, their life is infinitely more cluttered than when they carried all their worldly needs on their backs for six months on the Appalachian Trail.